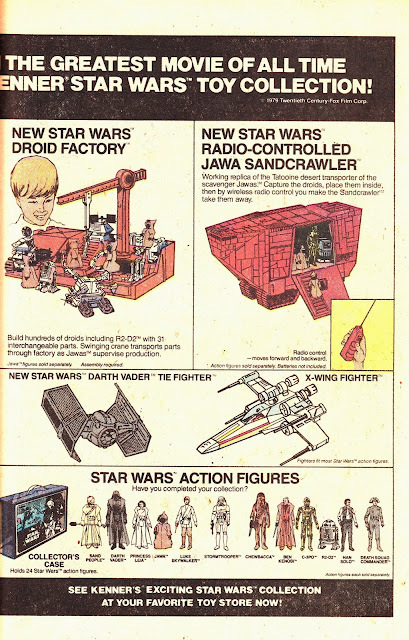 This US STAR WARS Kenner toy ad, from Marvel comics cover-dated February 1980 (therefore on-sale during the key late '79 gift buying season), teased Brits with several products that never crossed the Atlantic to form part of the Palitoy offering. The US Death Star (or, more accurately, slice of the Death Star) looked a lot less exciting than the British 'Death Dome' cardboard play set (cunningly reworked to form part of the original ACTION FORCE offering a few years later). The remote-controlled Jawa Crawler also never made the crossing. I'm also dubious that the somewhat peripheral Droid Factory appeared over here. And, I believe, the "Death Squad" figure was renamed "Death Star Commander" for the British line. 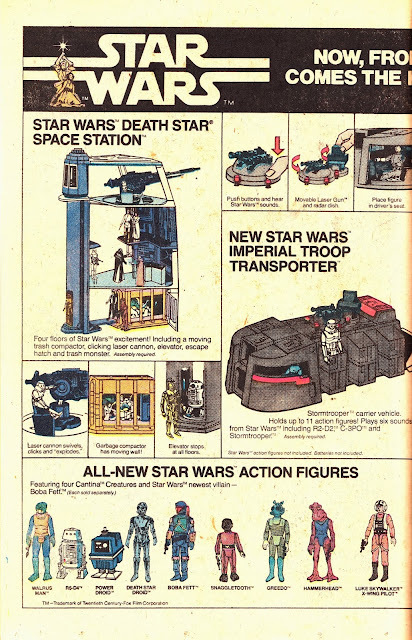 I DID have the off-camera (although it did make it into the Marvel strip) Imperial Troop Transporter and it was very cool. FYI - Droid Factory made it to UK Palitoy release with a blue base and no crane, but otherwise it was the same playset (US release has a yellow base). I think there was even a wonderfully hand-drawn comic strip-type ad in Star Wars Weekly, circa 1979, wherein Threepio is cursing the Jawas. "Death Squad Commander" was so called on his initial UK release, but later renamed as "Star Destroyer Commander" in the Empire Strikes Back repackaging, possibly to encourage purchasers of Darth Vader's Star Destroyer playset to pick up a few of the figures to act as minions. Oh, goes to show how little I accurately remember. Doh. Thanks for the clarifications. I do remember the STAR DESTROYER play set, it was one of those toys that just didn't look that interesting. I notice that they never called in THE EXECUTOR but, thinking about it, I'm not sure the name of the ship was mentioned on-screen. I still think that DEATH SQUAD COMMANDER does have rather negative connotations for a kids toy so I wouldn't be surprised if that was part of the motivation. Guns. Weapons and military paraphernalia (hello ACTION MAN!) were all well and good as long as you didn't dwell too deeply on the details. I wonder how many Red Shadows were massacred by Action Force in the pages of BATTLE ACTION FORCE? I will see if I can find a copy of SWW with the Palitoy ad and I'll post it if I do. I recall reading somewhere that the name Executor came about specifically as a possible playset name - it wasn't mentioned in the ESB movie. Kenner toys considered a number of different names for the playset but settled on the magnificently obvious "Darth Vader's Star Destroyer" in the end. I vaguely recall they found "Executor" was a word that most children didn't know, and was easily mistaken for "Executioner" (which, in my opinion, would have been a much stronger name for the ship, at least from a child's POV). Am I right in thinking the Marvel Comics adaptation calls the ship The Avenger? Regarding the "Death Squad" connotation... of course, Star Wars happily had "Stormtrooper" toys without anyone batting an eyelid, so who knows what the reasoning was.